Bulkmatic Silo Safety Valves are used to protect bins and silos from overpressure and underpressure damage. Underpressure collapse of a silo may occur if a column of material that has hung up in the silo suddenly dislodges and slides down creating a vacuum above the material. For the prevention of overpressure damage the valve would typically be fitted to bins and silos that are fed by a pneumatic conveying line or fed from a bulk tanker. Optional weather cowls are supplied for outdoor applications. A rubber seal on both flaps ensures an air tight seal. The overpressure valve pressure and vacuum settings can be adjusted by changing the weights fitted to the sealing flaps. Standard settings are at +1.5 kPa and –1.5 kPa. 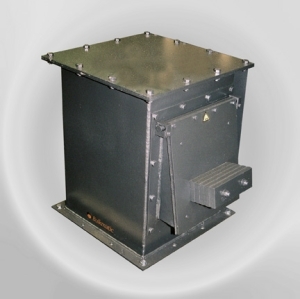 The unit may not be used as a substitute for an explosion panel for potentially explosive products in the bin or silo. Typical material of construction is mild steel. Stainless steel units are also available. 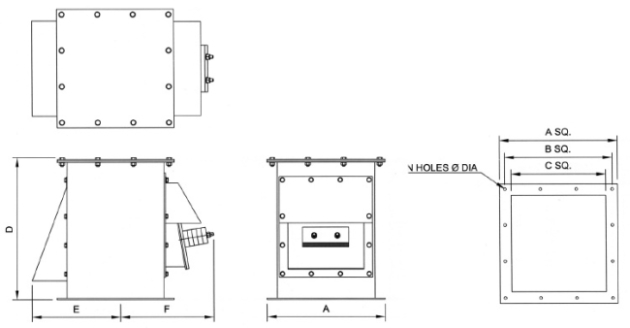 The silo safety valve can be ordered as an overpressure valve, vacuum breaker valve or as a combination of the two. Standard sizes include: 300, 400 and 500. Other sizes and configurations are supplied on request.